Sumo List Builder Review: Is It Worth Using To Build Your List? Everyone wants a bigger list, right? Putting a well-designed, well-placed opt-in offer in front of your visitors is the way to do it, but that’s often easier said than done. Plenty of list building tools exist to remove those technical barriers and eliminate guesswork from the equation. The freemium Sumo List Builder plugin has some nice features for beginning marketers. But the paid version doesn’t provide as much value as its competitors. The question is, which one makes sense for your business? Whether you’re just starting out, or you already have some subscribers under your belt, it’s easy to get lost in the sea of list building solutions. In today’s review, we’ll be taking a look at Sumo List Builder — one of the most popular freemium WordPress plugins in this category. Unlike most WordPress plugins, Sumo List Builder has a unique interface that sits on top of your dashboard. You’ll then be transported into Sumo-land, where you can configure each of the Sumo tools to your heart’s desire. Honestly, it’s a little jarring at first. You don’t quite know if you’ve been redirected away from your WordPress dashboard, or if it is indeed a full-screen overlay. You get used to it, but not before accidentally hitting your browser’s back button a few times. The top bar offers a few other options, such as notifications and account settings. Nothing earth-shattering, but it’s nice to know. Overall, I like what they’ve done here and I think the dedicated Sumo interface makes sense when you factor in the suite of tools available. Since this is a review for Sumo List Builder, however, that’s the tool we’re going to focus on for the rest of this article. Before you get to form types, Sumo does something a little different to most other list building tools. It asks about your campaign goal, or what exactly you’re trying to achieve. Depending on which of these goals you select, the rest of the steps will change accordingly. For example, if you choose to collect Push Notifications, the form types and designs will change to match. In reality, this could easily be part of the left navigation, but it feels more guided because it’s presented in a step-by-step, wizard-like fashion. Continuing with the most obvious goal for List Builder users, collecting emails, you’ll then be asked to select your form type. Click trigger popup: like a standard popup, but with a click trigger. There’s also a ‘Cart Casino’ form type which is only available on the (very expensive) E-commerce plan, but more on that later. Once you’ve selected your form type, it’s time to design the form. Sumo gives you a default design to work with, and this is what you’ll see on choosing a form type, but it can be changed in this step. You’ll see the library of templates in the wizard, and clicking on any of these will change the preview to the right. It works, but I wasn’t impressed by the amount of scrolling I had to do, and thumbnails aren’t easy to work with either. Perhaps the template library should open into (yet another) overlay? I don’t know, but something feels off here. That aside, there are over 50+ templates to choose from with plenty of variations. The quality was also pretty high across the board. Once you’ve selected a template, you can begin customizing it. In the screenshot above, clicking the green strip layer turned the form template area into a customizer. You’ll also notice a change to the bars appearing at the top and bottom of the form, leaving me confused as to what to focus on. This is where I felt the user experience took a turn, and I was forced to spend some time getting to grips with Sumo’s form editor. Again, these settings are constrained in an uncomfortably small scroll area, but there’s a LOT you can do here in terms of customization. This is also where you edit text on your form. Unlike modern page builders (Elementor, Thrive Architect, etc. ), there’s no inline editing here. Styling and text editing is one thing, but what about moving the layers? You’ll be pleased to know this is a drag and drop editor, and unlike most visual editors on the market, it isn’t section based. Yep, you can literally move layers and drop them anywhere on the form. My biggest worry with this system was not being able to place elements correctly, causing misalignment. Fortunately, they do snap in place. Going back to that top bar, you can reorder, duplicate and delete layers, as well as add new layer elements. Sumo has a strong selection of different elements to choose from, including things like countdown timers and a GDPR-approved checkbox. Finally, the bottom bar allows you to view and select from a list of layers, undo or redo changes, preview your form, and enter full-screen mode. The preview works as expected, however, giving you a (real) full-screen view of your form in action. Overall, I have mixed feelings about the design experience. While Sumo loses marks on the editing interface, it manages to gain a few back on design variation and flexibility. You’ve settled on the design. Now it’s time to figure out where and when that form should display. As you transition to this step, Sumo will offer you a choice between ‘Smart Mode’ and ‘Manual Mode’. The default ‘Smart Mode’ sounded awesome, but not something I’ve seen in any other list building tool so I wasn’t exactly sure how it worked. Unfortunately, the interface did little to help my confusion, so I was forced to seek more information from the Sumo website. In other words, it’s an exit-intent. The mystery here is why they couldn’t just call it that, and perhaps more importantly, why they couldn’t include more information within the interface itself? One thing I should point out is that these options will change depending on your form type. For example, an inline form doesn’t “pop up”, so Sumo removes those settings since they’re redundant. And a scroll box form requires a different configuration, so Sumo adds new settings to the visibility section. For the sake of consistency, I’ll stick to the popup form type for the rest of the review. Here you can set a custom timed delay of seconds or minutes after which point the popup will trigger regardless. The tab beside it, however, is your exit-intent. Again, you can set a custom display frequency for when a when a visitor tries to leave your site, but there’s strangely no way to disable it entirely. Moving on, we have display rules. These rules allow you to dictate exactly what pages your popup is shown on. This “rule builder” allows you to include/exclude display rules based on a number of factors. URL’s: paths, query parameter, hash. Devices: desktop, mobile, sizes, OS, browser, IP address. Visitors: first page view, total page views, location, date. So yeah, a lot of control here which means you can effectively show unique, targeted opt-in forms to your visitors. You can stack as many of these rules as you want, leaving you with thousands of potential combinations. While these kinds of display rules aren’t unique to Sumo List Builder, I particularly like the way the interface is set up. Finally, let’s talk about the ‘Advanced Settings’ button. Clicking this will reveal some additional settings better suited for, well… advanced users. Personally, I don’t feel these are very “advanced” but maybe that’s just me. In any case, the option to hide forms based on opt-in status is awesome, and something that should probably be a default setting for ANY list building tool. Overall, while I did find the Smart Mode a little vague and underwhelming, Manual Mode more than made up for it. What good is a list builder tool in 2018 without A/B testing to boot? Sumo knows the answer, which is why this thing ships with an in-built split testing feature to be used with any form type. To set up a test, you’ll first need to go to your forms, then select ‘Test’ from the top navigation bar. You’ll need to have at least one existing form before you can set up a test. That way, Sumo List Builder can duplicate that form in order for you to create a variant of it. Once you’ve selected your form, you can click the green ‘Start Test’ button to proceed. From here, you’ll be thrown into the same form creation process I outlined earlier, where you can configure everything from your goal, form type, visibility, design and more. Of course, you can stick to the same settings as your original form, and Sumo will create a copy of that form by default… so you can build up or down from that. The difference here, however, is that Sumo will pitch these forms against each other to see which converts best. The sliders let you choose how often each form should display relative to the other, though 50% is recommended for the fastest, most accurate results. You can run a test for as long as needed, and the test results will continue to update during that time. Once you’re happy with the numbers, you can click the ‘Use This’ button next to the winning design to apply that for all visitors. Overall, while some A/B testing platforms feel like an afterthought, Sumo List Builder clearly had some thought put into it. Unlike other list building tools, Sumo allows you to manage subscribers and build campaigns without any additional integrations. Pretty basic, but it’s perfect for those who want an easy, all-in-one solution. Of course, not everyone wants to just up and leave their email marketing service, and fortunately, Sumo offers a long list of integrations for paid users. All the big guys are there, including Aweber, MailChimp, ConvertKit, and ActiveCampaign. More of these integrations become available on the higher tier paid plans — such as Klaviyo on the E-commerce plan. Once your integration is set up, Sumo will sync all subscribers to your chosen provider. Easy peasy. Overall, free users will struggle with the lack of integrations available, but becoming a paid subscriber will unlock what is otherwise a super comprehensive list. In 2018 there has never been a better selection of free tools available to online business owners. Sumo is one of those tools, and while it does operate on a freemium model, you get a pretty decent feature set for your $0. Of course, the free version has limitations such as a limited subscriber count, fewer form templates, and Sumo branding. For this review, I tested both a free and paid plan to see how the experience differed from one to the next. A constant push from Sumo to pony up some money. It’s not the most aggressive freemium tool I’ve ever seen, but it bugged me no less. For example, during the ‘Design’ step, clicking any of the templates above will take you to the pricing screen without warning. Like I said, it’s still a very usable tool, and a great option if you’re starting out, but I feel it could benefit from a little toning down in some areas. As for becoming a premium member, honestly, I found this tool a little overpriced for what it is — a list building plugin. If you consider that something like MailerLite has email capture built in, along with a free plan of up to 1,000 subscribers…. Well, it’s hard to make a case for choosing Sumo over competitors, especially on the lower end where the e-commerce features aren’t included. Having known about Sumo List Builder for many years now, this was a plugin I’d developed high expectations for. For the most part, it met those expectations. It has a dedicated interface, various form types, great templates, strong customization, advanced display preferences, and virtually everything you need to create high-converting opt-in forms. The problem, however, is that while features are available in the free version, the tight restrictions means you’ll quickly outgrow the free tier and be required to pay anyway. Given that there are other, equally impressive list builders at a much lower price point, this may be one for those with a healthier budget and an unwavering loyalty for Sumo products. Thinking of giving it a spin? 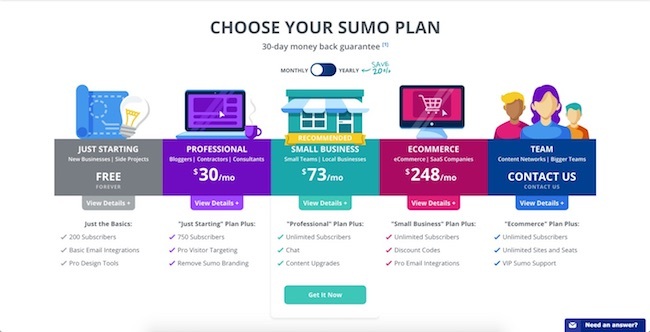 Click here try Sumo List Builder for free, or become a paid subscriber and unlock all the benefits. Affiliate Disclaimer: I hope you enjoyed our Sumo List Builder review. Please note that some of the links inside this article may be affiliate links for Sumo tools. That means that if you click on one of the links and sign up, we may get an affiliate commission for it. If you do happen to click, we really appreciate it! Any money we make keeps this site running smoothly and allows us to keep producing these high-quality reviews.